Kids love bath time with toys, but as you know, the bathroom usually ends up looking like a war zone – covered in toys and water! 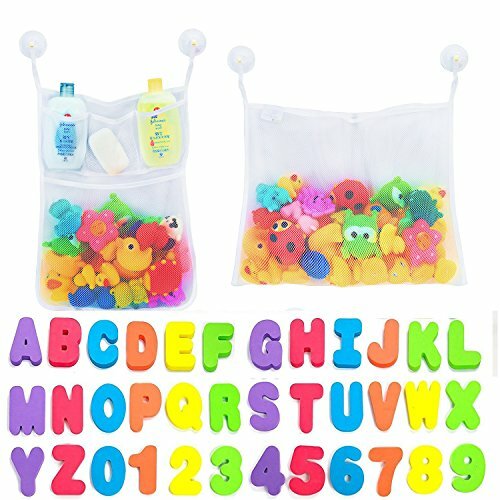 Well, the good news is, our mesh toy net is the most affordable bath organization solution there is! Because of all the water, bath toys can end up getting all slimy and gross when kept lying around or in a basin, but with our netting, there is plenty of room for air to circulate while all the water drains out leaving toys clean and dry with no mess! Why not extend teaching to the tub for double the fun? 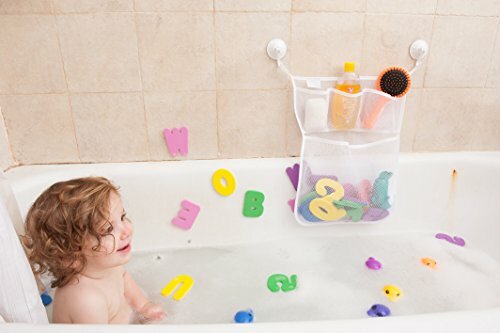 Our bath letters come in six fun colors, stick to bathroom walls when wet, are totally safe & non-toxic and turn bath time into learning time! You can help your child identify the alphabet, learn to count, spell simple words, group by color and much more. An added bonus? 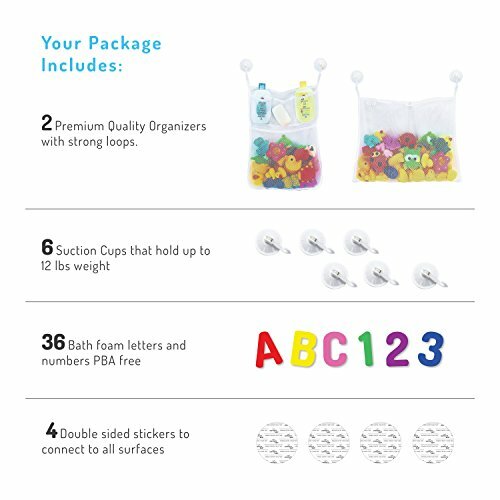 When you’re done, you can pack up and store the letters in the mesh organizer, ready for next time! 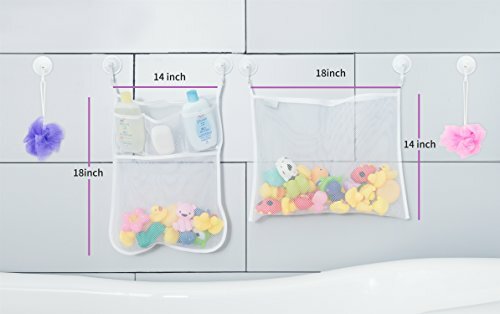 Unlike some of the other bathroom organizer nets, we include 6 super strong suction cups instead of just 4. Our suction cups are perfect for smooth tiles, mirrors, and other smooth surfaces, but they are not made for wood, wallpaper, fabric, concrete or irregular surfaces. To make sure you get the best suction, clean the surface before mounting the suction cups and you’ll never need to worry about our bath nets falling off the wall! 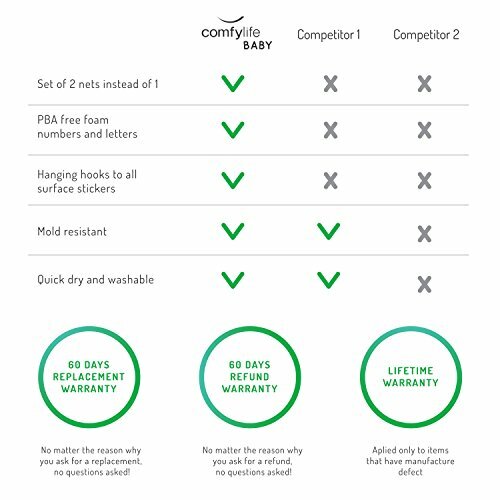 We offer unprecedented, lifetime money back or replacement guarantee – no questioned asked! You get the best quality possible, or your money back! So with nothing to lose, click add to cart now and reclaim your bathroom today!NO MORE MOLDY TOYS! 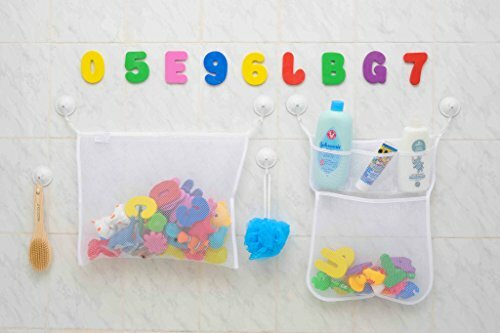 Our super strong mesh net makes for the ideal bath toys organizer because the netting is specially spaced so that plenty of air can circulate while all the water drains out. Your kids’ toys will stay dry and clean – not all slimy and wet! 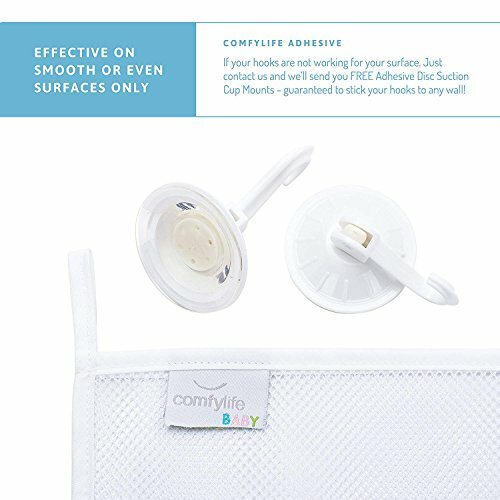 POWERFUL SUCTION CUPS + FREE REPLACEMENTS: Unlike some of the other bathroom organizer nets, we include 6 super strong suction cups instead of just 4. Our suction cups ‘lock” once you move the hook down so your bath storage net will stay stuck to the wall without constantly falling off! To ensure the BEST SUCTION possible, please just make sure the surface is FLAT and EVEN. 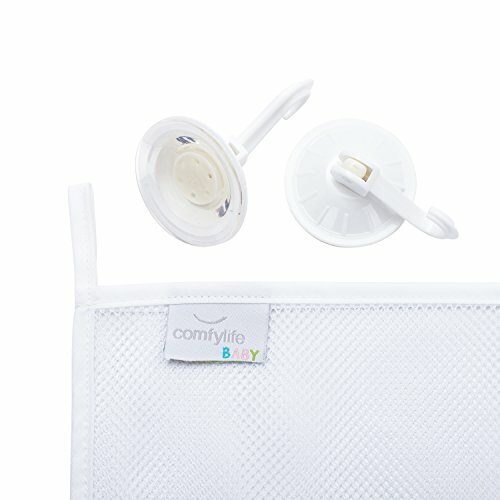 Plus we include 4 DOUBLE SIDED replacement suction pads so you can hang the net ANYWHERE! MULTI-USE ORGANIZER: This is the bathroom storage and organization solution you’ve been waiting for! The large pocket is perfect for kids’ toys (it holds a ton!) and the second organizer has a pouch and 3 pockets for soap, shampoo and more. Then you can use keep the toothbrushes & toothpaste in the cute holder (electric or normal toothbrushes) – Your child will love it and your bathroom will be kept looking neat and clean, all the time!